One man's two-stroke penalty is another man's source of free golf balls. 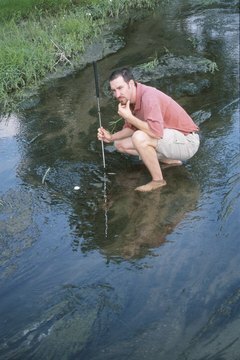 Harvesting golf balls from the bottom of a pond or stream on a course is a great way to get balls for free. Unfortunately, often the balls found on the bottom of a pond will come out of the water looking entirely unfit for play on a course or range, as they are likely to be covered in slime and mud. While pond scum is more difficult to clean off of a ball than simple mud, with work, it can often be removed, providing you with a batch of clean golf balls. Run the golf balls through a cycle in a conventional dishwasher, without detergent. While the process of pressure-washing the balls with hot water may damage some of the balls, it will only do so to balls that were in the water so long that they corroded to a point beyond being playable going forward. Prepare a tub of bleach and allow the dirty golf balls to sit in the tub for several minutes. Remove the balls while wearing rubber gloves to protect your skin, and run them through a rinse of clean water until no traces of bleach remain before handling them further. Place the balls in a tub of water, closely nestled together, and place one or more denture cleaning tabs in the water in the middle of the balls. The tabs release gas that travels up over the balls, removing debris from their surface. Allow the balls to sit in a tub or bucket of hot water for 30 minutes. Scrub the balls with a rag or sponge after they have been sitting in the water to remove slime and debris. Repeat the water soaking if needed to fully clean the balls.